This two stage MK36 Wash/Rinse System incorporates high powered sweep frequency ultrasonics in the wash station. 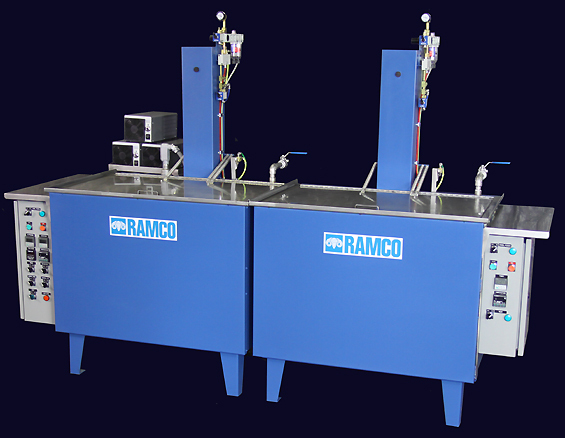 The heart of the RAMCO system is the adroit use of an elevator within each processing chamber. The elevator is used to transport components into and out of each chamber. However, its most important function is to position and continuously move components within the working zone during the process. It is this aspect of its function that allows RAMCO systems to achieve superior results in washing, rinsing and drying. We call this Dynamic Flow Combination. The effect of Dynamic Flow Combination is better coverage of component surfaces (minimizing standing waves and/or shadowing) producing more consistent results and accelerated processing times. The platform elevator is specifically designed to provide maximum transmission of ultra sonic energy without compromising structural integrity. The ultrasonics are alternated with platform oscillation and solution turbulation. 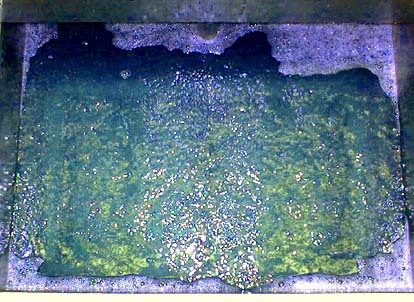 The steps are sequenced with dual digital cascading timers for agitation washing before (or after) the ultrasonic cleaning phase. And using our MultipleRollover feature the dual mode process can be repeated for any number of preset “rollovers”. The results are faster cleaning and more effective overall processing. Furthermore, the ultrasonic stage can be set to provide vertical oscillation of the work during the cycle. A selector switch is provided for static ultrasonic or oscillating ultrasonic modes. This feature provides a superior ultrasonic washing action over conventional systems by moving the work through the peaks and nodes of the wave energy.